H. E. Liz Thompson, former Energy and Environment Minister of Barbados, was awarded the prestigious Champions of the Earth Award by the United Nations Environment Programme (UNEP) on 22 April, 2008. Thompson was awarded for the remarkable role that she played in environmental awareness and protection across the Caribbean region. Barbados on 25 May 2018 elected Mia Mottley as its first woman prime minister since gaining independence from Britain in 1966. Dame Nita Barrow was the first female Governor-General of Barbados. She was in office from 6 June 1990 to 19 December 1995. Donnya Piggott of Barbados received the Queen's Young Leaders Award on 22 June 2015 from Her Majesty the Queen Elizabeth for her supports to sexual minorities. 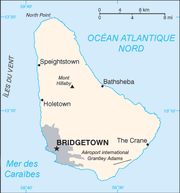 Historic Bridgetown and It's Garrison in Barbados were listed as a UNESCO World Heritage Site in 2011. Bridgetown and its Garrison is an outstanding example of British colonial architecture consisting of a well-preserved old town built in the 17th, 18th and 19th centuries. Ronelle King from the Barbados, who is committed to helping end violence against women in the Caribbean, received a Queen’s Young Leaders award at a ceremony held at the Buckingham Palace, in London on 26 June 2018. Jamilla Sealy of Barbados received the 2017 Queen’s Young Leaders Award for raising awareness about the importance of protecting the environment. Christaneisha Soleyn from Barbados, founder of a charity called The United Youth Leaders of Barbados, was awarded the 2013 Caribbean region Commonwealth Youth Award for her works with young people aged 15-25 on their personal development and the issues that are affecting their peers. Barbados was admitted as a member of the United Nations (UN) on 9 December 1966.